Believe me, that thing you’re using to read this article is not your friend. And even if you’re reading this on your laptop of PC, there’s one thing I want to ask you: How important is your device to you? I was shocked when I read a weird statistic a while back. An experiment, which was conducted by the universities of Würzburg and Nottingham Trent, revealed that 37.4% of the participants rated their phone as more or equally important in relation to their close friends. Seriously, what’s wrong with people? 29.4 per cent even said their smartphone was equally important, or more important, to them than their parents! Or is there something wrong with me? Am I just an old school person who likes to read books all day and only has a few close friends and family members that he actually values? Look, I’m not joking around. Smartphones are dangerous. Not because they may cause stress, anxiety, and even depression, but because they change your behavior. It seems like we can’t focus on one thing for more than 5 seconds. Why? Well, we can’t because our smartphone is constantly going off. Not because people are calling you (it seems like people are afraid of calling these days, but that’s another topic), but because you’re constantly getting notifications about THINGS THAT DON’T MATTER. Also, I’ve stopped immediately responding to notifications. That doesn’t mean I don’t value other people who try to reach me. It means that I refuse to be a slave to my phone. I control my phone. For most of us, it’s the other way around. In the past, Facebook, Instagram, Apple, Google, etc, all controlled my mind. Obviously, they still do because the only way to escape those idiots is to cut yourself off and run to the woods. That’s not realistic. I like my phone. But I don’t need it. The results have been great since I started using my smartphone in the above way. During the past two years, I got more things done than ever. And, I still have time to work out daily, hang out with my friends, have dinner with my family, and spend time with my lady friend. You and I both have the same 24 hours at our disposal. The difference maker is how you spend those 1440 minutes each day. To be honest, I think I still have much to improve about my effectiveness. No one reaches peak productivity. Nor is it important to be the most productive person in the world. How you want to spend your time is your business. 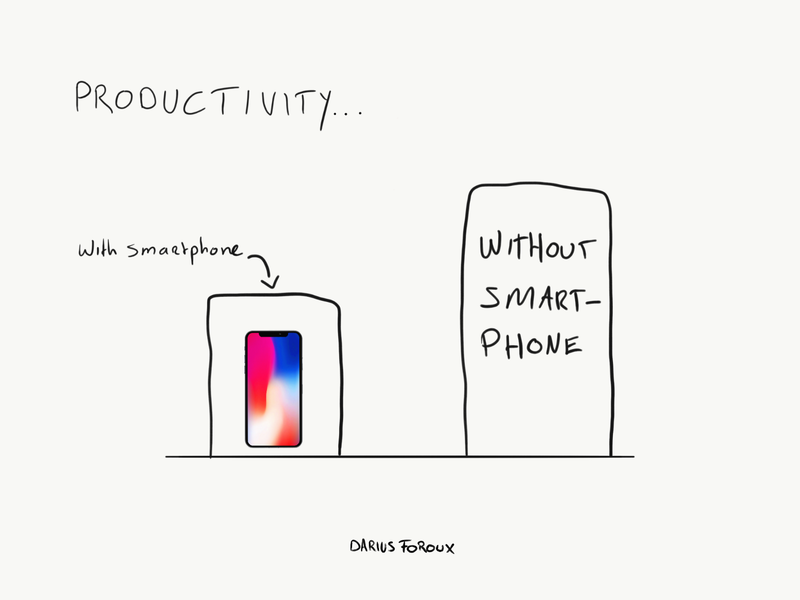 But please don’t tell me you don’t want to be 26% more productive by just changing one unimportant thing in your life: Your smartphone behavior. And if you wonder why not more people telling you to get rid of that thing, realize that they are trying to get to your wallet. Also, social media people who claim that they run their business with their smartphone are doing the exact same thing. They need you to consume their content, on you guessed it, your smartphone. Apple will also never tell us, “don’t mind buying the new iPhone because it’s going to destroy your productivity.” Of course not, they try to tell you the opposite. And without a doubt, smartphones also improve productivity. You probably found my articles on your phone. That’s a great thing. And, I also read a lot of articles and books on my phone. But you and I use the device to learn something, which is always a good thing. People who make phones and apps are smarter than us. Their only goal is to get you hooked. I think it’s good to realize that. That’s why I often try to remind myself not to depend on smartphones too much because my attention matters more than productivity. It’s time to reclaim your attention. And thereby, reclaim your life. It’s worth it.